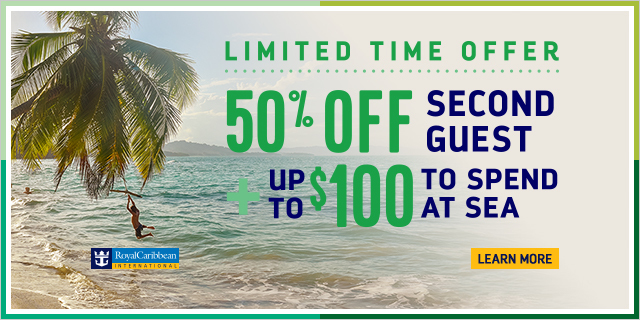 Royal Caribbean's next sales promotion begins today, with a BOGO (Buy One Guest, Get Second Guest 50% Off) and up to $100 onboard credit per stateroom to spend at sea. The November BOGO offer runs from November 3 - 30, 2016 and is valid on sailings departing on or after Dec 3, 2016. Offer excludes China departures. BOGO is combinable with adjoining 25% Savings for 3rd and 4th guests, OBC, Crown & Anchor discounts and NextCruise offers. BOGO, 3rd and 4th Guest Savings and OBC are not combinable with restricted rates (for example, Seniors, Residents, Military. OBC is not combinable with Crown & Anchor discounts. All offers are not combinable with any other offer or promotion, including, but not limited to, Standard Group, Interline, Travel Agent, Travel Agent Friends and Family, Weekly Sales Events, Net Rates, Shareholder Benefits.